Spring has really arrived at last although the wind is bitter and the grass is not growing very fast for cutting silage at the end of this month. 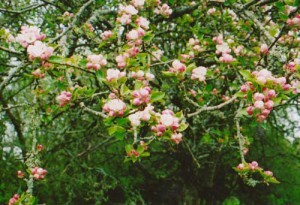 Apple blossom is in bloom in the orchard and there are blue bells in the spinneys. I have spotted some cowslips in the Sheepwash field. The orphan lambs have now been weaned and are out to grass although as soon as they hear a human voice they expect to have some more milk!